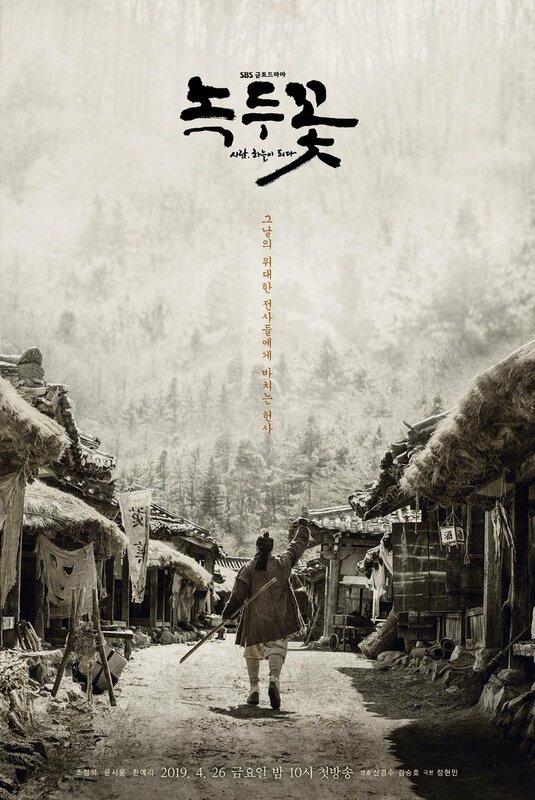 The drama is about the Battle of Ugeumchi that took place in 1894 during the Donghak Peasant Revolution. Baek Yi Kang (Jo Jung Suk) is the older brother who was born out of wedlock as the son of his father’s wife’s slave. With a sharp look and cold smile, he speaks with sarcasm in his voice and likes to pick a fight. Baek Yi Hyun (Yoon Shi Yoon) is the younger brother of Baek Yi Kang. While he is the youngest son in the family, he is also the first “rightful son” born under the wife. With a graceful appearance and speaking manner, he shows much respect for his older brother. Song Ja In (Han Ye Ri)is the only child of Song Bong Gil, the peddler of peddlers in Jeolla Province. With both charisma and courage, she also runs a shop where she trades goods for money, striving to be the best peddler in the history of Korea. Jo Jung Suk and Yoon Shi Yoon may be working together in a new drama! On November 22, it was reported that the two actors will be starring in upcoming SBS drama “Ugeumchi” (literal title). If Han Ye Ri accepts, it will be her first SBS drama since “Switch,” which concluded in May this year. “Ugeumchi” is set in 1894 and is about the Battle of Ugeumchi during the Donghak Peasant Revolution. Also in talks for the drama are Jo Jung Suk and Yoon Shi Yoon, who would be playing half brothers on opposing sides. Jo Jung Suk, Han Ye Ri, and Yoon Shi Yoon are confirmed for an upcoming SBS drama! On January 3, a source confirmed that the three actors will be working together for the upcoming drama “Ugeumchi” (working title). The drama will tell a story of two brothers who have different mothers but share the same father. They get separated during a riot that is now known as the Donghak Peasant’s Movement in 1894, where religious leaders of Donghak (translates to “Eastern Religion”) and the peasants of Jeolla Province joined forces together against the government that was pushing for the growth of Catholicism at the time. Jo Jung Suk will appear as the older brother Baek Yi Kang who was born out of wedlock as the son of his father’s wife’s slave. With a sharp look and cold smile, he speaks with sarcasm in his voice and likes to pick a fight. On the other hand, Yoon Shi Yoon will play the role of the younger brother Baek Yi Hyun. While he is the youngest son in the family, he is also the first “rightful son” born under the wife. With a graceful appearance and speaking manner, he shows much respect for his older brother. Lastly, Han Ye Ri will take the role of Song Ja In. She is the only child of Song Bong Gil, the peddler of peddlers in Jeolla Province. With both charisma and courage, she also runs a shop where she trades goods for money, striving to be the best peddler in the history of Korea. “Ugeumchi” is written by Jung Hyun Min of “Jeong Do Jeon” and “Assembly” and will be directed by Shin Kyung Soo of “Three Days” and “Six Flying Dragons.” It is set to air early 2019 as SBS’s new Wednesday-Thursday drama. Please check the drama index before creating a thread. There was already a drama thread for this project, so I merged your thread with the older one. thanks for that. It took me a while to create coz I kept losing what I was typing. Sorry for the double post. Thanks. I saw that there is a title change. I am sure there will be an official English title as well. @larus where did you get the info about Lee Jeong Heon being part of the cast? “Mung Bean Flower” will first air sometime during the first half of this year in South Korea. where did you get the info about Lee Jeong Heon﻿ being part of the cast? There were articles on Internet even before the confirmation of the lead actors. The release date is april 2019? I thought lee seungi ‘s vagabond will air on may 2019? Same slot wed and thurs, is it conflict? I think I read somewhere about tI guess when they accepted Vagabong on SBS, the time slot for Myung Bean Flower became uncertain. I changed the released date to not create confusion. Thanks. It's Friday-Saturday drama, it should air right after Hot Blooded Priest. Btw actor Lee Jung Heon oficially changed his name to Lee Ro Gon. It's a Monday Tuesday drama, it should air right after Hot Blooded Priest. Schedule for Hot Blooded Priest still seems unclear. Some think it will be on the Friday/Saturday slot. SBS will cancel the Saturday slot. I think they want to establish their Friday/Saturday slot more. And this drama is supposed to follow on this slot. Monday/Tuesday slot is already filled with other dramas, Haechi etc. Oh, I don't really know about HBP, it was listed as MT drama on initial reports, but it's not anymore, my mistake; anyway it's almost sure Mung Bean Flower is going to be Friday-Saturday drama. I'm too distracted today, really. Some background about why the Mung (Green) Bean reference (thanks @blackberrypie). This sounds like a serious historical drama. It's written by a man so I think the feuding of the brothers caught up on opposing sides of the revolt will be the main emphasis. There may or may not be any romance. If there is, it will not have much air time. This sounds like a serious historical drama. It's written by a man so I think the feuding of the brothers caught up on opposing sides of the revolt will be the main emphasis. There may or may not be any romance. If there is, it will not have much air time. I sense that this drama will have lots of tragedies. The tragic is not only that brothers will be on the opposite sides but we`ll see how the peasant force will lose the battle in the end because of their outdated weapons. From what I read the Korean government had difficulty in suppressing the peasant rebellion and called forces outside the country to defeat it. I think the romance will be bittersweet. I hope there is a little romance along with all these tragedies but it is possible that showing personal relationship in the drama (love, friendship, family ) to make the losses even more painful for the audience. I love this cast and production team, but I'm not sure that my heart can take the level of tragedy this drama seems to represent. Korea seems to be so much about fights pitting brother against brother. The most recent one, of course, was the Korean War from which many families still deal with being separated from other branches of the family. I'm torn on this drama because I do expect it to be such a good drama without any weaknesses, but it will also not have modern sensibilities to soften the tragedy that is sure to happen when brothers follow their duties as conscience dictates and it ends up pitting them directly against each other. Perhaps I should just watch the initial episodes which seem to promise some complex family dynamics and a healthy dose of bromance? I do feel as if it will be a question of WHEN I watch this, though, rather than IF I'll watch this. @larus @stroppyse Yeah. I am bracing myself for lots of tears. There are no winners in wars/conflict. I think General Green Bean (I love his name - green/mung beans were probably the staple for peasants in their diet) was just the impetus for change. He may have died early in the revolt but he died a martyr so his legacy propelled the peasantry to continue the fight for injustice in his absence. And the brothers got entangled in it. JJS's character (YK) is oppressed and probably has an axe to grind being the illegitimate son (same father as YSY's character - YH). He was likely to have been deprived of the rights of a good education, status and all the luxuries afforded to the legitimate son YH. So when the rebellion began with General Mung Bean, he would've had the means to right the injustices prevalent in his life and he would likely join the rebel forces. YH on the other hand, I feel like will end up being forced into it unwittingly. He sounds more like a conscientious objector or a pacifist. He respects his older brother YK. Being educated, he will likely understand the ideology and stance of the peasants but he will not like the means whereby they enact change. Peasant rebellions often have innocent casualties because all those years of repressed anger gets released and innocent women, children and men (who were likely really decent and non-repressive people) end up caught in the crossfire. The peasants will see ALL landowners and upper class folk as their enemies and seek to kill/destroy them regardless. YH is likely to then be forced to protect the innocents thereby making him out to be 'on the opposing side' as a result. That's how I read the synopsis anyway. As for Han YeRi's character, she sounds quite progressive in the synopsis. She wants to the the best 'peddler' (business woman) in the whole of Korea? She's got lofty ideals. She's not one to sit by and wait for Prince Charming to come by and provide for her. She sounds like a strong woman with a mind of her own. So if there's a romance at all, she doesn't sound like she's one to be all shy and retiring. Being in a 'merchant' trade, her business will only thrive if the economy is humming along...she needs the 'rich people' around to grow her business? Peasants don't have much money so they can't buy her goods? So perhaps she will be the lynchpin that marries the 2 worlds or gives that alternative perspective to the different ideologies. Yes! my favs! I just don't know the female lead but count me in this one. Serious historical drama! What "My Country?" Hahaha Btw, that's another historical 2019 drama Yang Se Jong and Woo do Whan..of course going to check it as well. it's more like historical action drama.